The placenta is an organ that grows with your baby, and attaches to the lining of your womb. It keeps your blood supply and your baby's blood supply separate, while acting as a link between the two. You can find out more information about the placenta and what it does on NHS – What is the placenta? When you're in labour, you give birth to your baby first and the placenta some time after. The time between the birth of your baby and the placenta varies. It's very important to think about when to cut the umbilical cord. Evidence now supports waiting at least two to three minutes for the blood from the placenta to move to the baby before clamping and cutting the cord. This means the baby continues to receive oxygen through the umbilical cord and has higher iron levels for at least the first six months of life. For premature births, delayed cord clamping protects the baby from some of the problems that can be caused by being born early. Cord clamping can be delayed at most births, including caesarean section. Make sure you talk about this with your midwife or LMC. 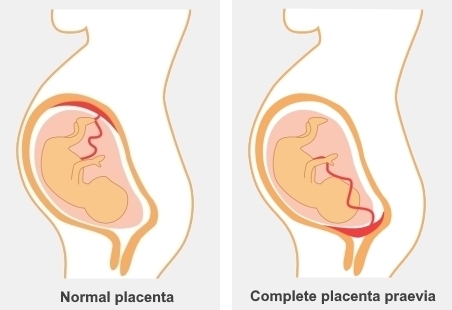 Placenta praevia is a complication where the placenta implants in the lower part of your uterus (a partial placenta praevia) and occasionally over the neck of your womb, or cervical os, (complete placenta praevia). Women with placenta praevia may have some bleeding in the third trimester. If the placenta is too close to the neck of your womb, or covering it at the end of pregnancy, you'll need to give birth by caesarean section. You can find more information about placenta praevia in this booklet (link downloads a PDF). In Māori culture, the whenua (placenta) is traditionally returned to the whenua (land) by burying it in a significant place. Many families keep their placenta to bury it themselves. If you wish to bury your placenta on public land, the Christchurch City Council has designated three areas in local parks. To find out more information, phone the Christchurch City Council call centre on (03) 941‑8999. If you don't want to keep the placenta, you can leave it at the hospital to be incinerated. If you had complications during pregnancy or childbirth, doctors may ask to test your placenta to understand why the complications happened. They will track the placenta while it's being tested and can return it to you if you wish. If this happens, the placenta will have been treated with chemicals, so you must handle it with gloves and bury it in a suitable place (where pets can't dig it up). It will not look the same and will have had pieces removed for testing. You can opt not to have your placenta treated with chemicals if you prefer. In this case you'll need to collect it as soon as the hospital contacts you to say it's available.